Gras’ transfixing road movie and Cannes Film Festival prizewinner follows a young Congolese man named Kabwita through the making, transporting, and selling of charcoal – from the felling of a tree to pushing a teetering bicycle weighed down with bulging sacks along treacherous dirt roads to contending with motorists, extortionists, and potential customers. As Gras observes Kabwita’s perilous trade, he derives beauty from the monumental efforts that go into his day-to-day existence. Makala is a documentary that resembles a neorealist parable, locating an epic dimension in the humblest of existences. - Film Society Lincoln Centre. Simplicity is the key to the somber beauty of Makala, a documentary depicting a Congolese charcoal-maker doing his utmost to raise his family under penurious conditions. French director-photographer Emmanuel Gras’ camera embraces the subject’s every move with such rapt intimacy and cinematic poetry it’s easy to forget this is not a fictional drama. - Maggie Lee, Variety, 23 August 2018. "Time is going by so fast," frets solemn, hardworking Kabwita near the start of this documentary, as he contemplates the challenge of amassing enough cash to progress the building of his family home. Viewers who have just watched Kabwita painstakingly hack down a vast tree and prepare its wood for sale as charcoal may beg to differ, for 'fast' is one quality few would claim for this film. We will go on to watch Kabwita leave his home in the Democratic Republic of the Congo to transport the charcoal (the `makala' of the title), precariously tied in bundles on a pushbike, for sale at city markets; what seems 'fast' to Kabwita, pressured as he is by poverty, the changing seasons and the demands of growing children, is rendered languorous and beautiful to us by the loving attentions of director and cinematographer Emmanuel Gras. If the danger of aestheticising and exoticising the struggles of the poor is clear and present in a film such as this (and if it's a distinct challenge not to wonder if Kabwita might have preferred a lift on the camera crews truck to being filmed by them as he pushed his bike along endless roads), the unfussy respect Gras confers on his subject elevates this portrait from mere voyeurism to a generous and elegant meditation on what it is to work. 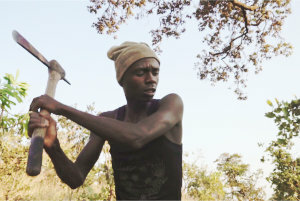 The initial scenes in which Kabwita chops down the tree, in a landscape so depleted by slash-and-burn farming practices that his family often subsists on rat meat, gather elemental force as he proceeds, until we seem to be watching a mini-drama encompassing all of man's relationship with nature. When the tree falls, with Gras's camera coiling around its beautiful branches, we're at once triumphant for the indefatigable Kabwita and heartbroken for the dwindling remains of a forest now barely worthy of the name. Lovely, yearning cello refrains, composed and played for the film by Gaspar Claus, remind us what other uses humans have found for the bodies of trees. Kabwita's subsequent journey cross-country to sell his charcoal is played as a very low-key road movie, reminiscent in its driven simplicity of David Lynch's The Straight Story (1999). Where Alvin Straight was played by an actor and adopted a lawnmower as his means of transport out of ornery eccentricity, Kabwita is playing himself, and proceeds on foot because he has to. But Gras, like Lynch, drip-feeds information to keep us engaged with a story that is as much about one man's private character, aspirations and regrets as it is about the global forces that influence his destiny. We learn early on that Kabwita can be touchy and sensitive as well as stoically productive; he whimpers and moans as his wife Lydie removes splinters from his feet, prompting her to accuse him of exaggerating the pain. He is also, we go on to discover, an attached and concerned parent: fretful about sourcing the right medicine for one of his children; unwilling to even see another, who lives away from home, in case having to part from him again upsets her too much. Acknowledgements of fatherhood as a complex emotional engagement, rather than a duty or chore imposed on men by women, are rare in any genre; the careful, unobtrusive manner in which Gras observes these revealing moments renders them all the more touching. Never does the director pin Kabwita down to speak to the camera about who he is or how he feels. We gather what we can about him largely from the play of light and emotion across his determined features. Elsewhere - as when man, bike and bundles trundle on through the pitch darkness, silhouetted against the light of nocturnal campfires - he's unashamedly glamorised as a figure of myth, a young and beautiful Sisyphus. The parable-like quality of the film becomes literal when Kabwita enters a church, there to experience a lively sermon on the subject of "the journey of the honest man', and to engage in his own act of prayer. Whether Kabwita is a regular churchgoer, or has simply stumbled into an environment that speaks directly to his wearied mind, we're not given to know, but the film's shift from poetic evocation of the practical into the spiritual realm is both startling and effective. Religious or not, we can't help but share in Kabwita's relief as he hands his worries over to his God. Like the opening sequence with the tree, the scene glories in the strange specialness of being human - of being an animal driven to transform and conquer and mythologise what surrounds it, and then to plead for divine help with all the resulting difficulties. - Hannah McGill, Sight and Sound, February 2018.